Around the month of April, the summers are already on. The days are hot and become hotter in the south by the end of the month. April normally comprises many regional festivals. Mostly because it is the first month in the Hindu calendar. 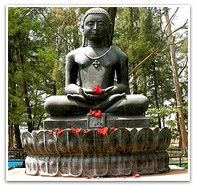 India has a large Jain community which celebrates the birth of the last, the 24th Teerthankar, Lord Mahavir. The Jains celebrate the birth anniversary of Mahavir, the founder of Jainism on a large scale. 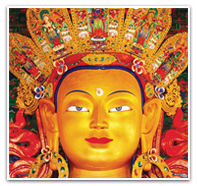 This religious event is largely observed by visiting sacred sites and worshipping the Teerthankars. The Hindu New year is celebrated through out the country in nearly all the states with different names. People mainly cook and eat sweets and wear new clothes and wish each other on this occasion. They sing and dance and start with new ventures on this day. The ninth day of the first month in the Hindu calendar is celebrated as the day of birth of the Hindu God, incarnation of Vishnu and the hero of the epic Ramayana, Lord Ram. The festival is celebrated all over the country with people fasting and worshipping the Lord for the whole day. Ramnavami is also celebrated as the Vasant Navratra and the celebration starts from the first lunar day of the bright fortnight of Chaitra and lasts up to Ramnavami. On Ashthami or the eighth day, Durga is worshipped. Both Ram and Durga symbolize the victory of good over the evil. Good Friday falling in April is observed by the Christians as the crucifixion of Jesus Christ. More than a celebration, it is the commemoration of the crucification. Christians in India observe fast 40 days prior to this period known as the lent. Masses and prayers are held. Two days later it’s Easter. Easter marks the resurrection of Jesus Christ. It is a day of great rejoicing and merry-making. Easter symbolizes the ultimate victory of good, over evil. Feasts are given, sweets exchanged and processions taken out on this occasion. Edible artificial and hard-boiled eggs are given on Easter as gifts among the Christian society in India. The scorching Indian summer starts by late April in the southern parts of India and by mid – May the Sun rays just roast the people all over India. Only the places at the foot hills of the Himalayas, or those surrounded by mountains, experience cool weather, during this time of the year. Many Hill stations of India organize various festivals to attract tourists in May. There are hardly any festivities during this time of the year. On the full moon day falling in May is the Buddha Pournima. A great day for the followers of Buddhism, who believe, that Lord Buddha was born, attained enlightenment and also left the mortal world on this very day. Huge celebrations and prayers are held at Bodhgaya in India and elsewhere also. The day is spent chanting hymns and prayers all day long. Summers continue in the month of June and July brings down the showers all over India. After the first rains the farmers are busy tilling the soil and pray for a good harvest. Small festivities regarding these prayers are celebrated regionally during this time of the year. The showers have slowed down by the month of August. This is supposed to be the most pious month in the Hindu calendar, called as the month of Shravan. Onset of Shravan brings festivities and celebrations throughout India. The first full moon falling in August celebrates the relations between a brother and a sister. On this day sisters tie a sacred thread called Rakhi on their brothers’ wrists and pray for their well being while the brothers return the love by gifting them and promising to take care of the sisters for the rest of their lives. This full moon day is celebrated as Nariyal or the Coconut Pournima along the coastal areas of India. It is basically festival of the fishermen who pray the sea God seeking his permission to venture into the sea to fish, after rest of two months, which is the peak monsoon season. Sweets made of coconut are prepared and everyone enjoys. 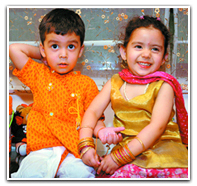 In South India, it is celebrated as Avani Avittam. The holy thread is changed and libation of water is offered to the ancestors and Rishis on this occasion. India gained independence from the British on 15th August 1947. This day is celebrated as the National day in India. The Prime Minister of India hoists the tri colour on the historic Red Fort in Delhi and gives a speech addressing the nation. The day is celebrated vibrantly by people and especially young children by making and hoisting flags and singing the national anthem. Chief Minister of various states hoists the flag and address the state. Eighth day of the black half in the month of Shravan is celebrated as the birthday of Lord Krishna, an incarnation of Vishnu. Legend says that the Lord was born in the midnight and it was raining heavily then. People all around the country celebrate this festival with equal fervour. They fast the whole day and rejoice the birth in the middle of the night by breaking the fast. Songs and dances are performed all around the temples of India and children make a small display of the birth scene of Lord Krishna.